Elsie and I have an inside joke about, what we call, the “pumpkin spice latte effect.” It’s our theory that right around the beginning of September everybody gets a little bit nicer/more considerate/happy. Us included. We are for SURE affected by the PSL effect. Why does this happen? What is behind this phenomenon? The obvious answer is that PSLs are back and available at Starbucks. I love to try coffee from just about anywhere, but I’m not above getting excited about PSL day! And I think on a “deeper” level somehow PSL day reminds us all that fall is in full swing. Here in southern Missouri that means cooler weather, hay rides, hot chocolate, apple picking, pumpkin carving, hot cider, layered clothing and, most importantly, the holidays are on their way. We are only about mid way through September but I have already spent quite a bit of money (and calories) on pumpkin spice lattes… Yeah. So I thought it might be a good idea to try and make my own PSL syrup at home. I LOVE how this turned out. I may have to make this a new tradition every September and create my own pumpkin spice latte effect. 🙂 Here’s my recipe, but feel free to adjust the spices to your own liking. In a pot combine all the ingredients. Stir together over medium heat until the sugar has dissolved. Continue cooking over low/medium heat for an additional 5-6 minutes (do not allow to boil). I know everyone’s taste varies, but could you give us (me ;)) an idea of how much of the PSL syrup and milk to use as a place to start? Thanks! This is great, can’t wait to try! This sounds amazing! I’ll have to make some and bring it to work to share! This is great because I just found out that the syrup Starbucks uses has condensed milk in it, making it non-vegan friendly. I too love all things pumpkin so I’m excited to try your recipe! That said, I’m totally snatching this recipe for a holiday party. Oooh! My husband is going to be so excited for what I am going to make today!!! Ha, you have been on Pinterest, I see – these recipes just seem to have exploded in the past couple of weeks! I must admit, I am not a coffee fan (ducks before people start hurling insults). Saying that, my husband is and he gets super excited about the PSL in Starbucks, but his habit is financially crippling! I’m delighted that we can, at least, develop a batch of syrup to maybe help curve the spending. As always, I enjoyed reading your humourous posts. I’m surprised by this, I don’t know why I thought it would be vegan, but as someone who is watching animal product intake, it’s good to know. Are all their syrups like that? You know, it’s totally amusing. I hail from the UK and I was really disturbed when I moved to Canada and everyone became excited as September rolled around. Yesssssssss! Life made! I’m always trying to take my favorite Starbucks drinks and make them at home. Once I mastered the White Chocolate Mocha, I was in heaven! Definitely will have to try this! SO excited to try this, and I know my girlfriend will die when she sees this. What an awesome idea! I’m totally making this all fall and winter! Do you know if there’s a way to make this into a pumpkin chai latte? Maybe just add the syrup to a chai store mix? Could be delicious! Or you could be super lazy like me and buy the creamer. It’s not as good though, but it works, in a pinch. Ha, it’s insane how my Instagram feed starts filling up with PSL shots come September. I generally stick to a cappuccino, but this would be a fun treat at home. Yum! I love using my homemade syrup: the Starbucks PSL is way too sweet for me, so it lets me control the flavor exactly. Grating a bit of real, whole nutmeg over the top makes the homemade latte even BETTER than the real thing! oh my goodness, that looks so good ! I am one of “those people” obsessed with the PSL (have been for the entire 10 years that Starbucks has been making them). So I of course had to drop everything and make your recipe right now. It is DELICIOUS! The syrup alone would be yummy on pancakes, ice cream, etc. And the leftover pumpkin and spices that strains out is like a spiced applesauce. Yummy! Thanks for sharing! Totally gonna try this soon! This is my favorite fall idea yet! Endless options: topping for ice cream, syrup for pancakes, glaze for pies and fall fruits. Thanks! Sometimes the most random foods are not vegan, and it’s really surprising. You really do have to read every label. I’m not sure about SB other syrups; I just heard about this recently via Veg News magazine. It’s a great resource! This is an amazing idea! I also have spent quite a bit of money of PSLs. It’s an addiction.. I am obsessed with the pumpkin coffee from Dunkin with cream but you are right to many calories.. I may have to give this a try! I don’t actually like pumpkin very much, but your homespun recipe sounds great. After pouring gallons of Starbucks’ pumpkin spice sauce into containers, I’d much rather snuggle up with this version. Starbucks’ secret? Sweetened condensed milk as the base. I myself am not a coffee drinker, but boy does that look delish! Thanks for sharing. This is going to come in super, super handy! Yes! I’ve been looking for a good recipe for a PSL. Can’t wait to give this a try. You have just saved me a billion dollars, because I am a PSL ADDICT. Thanks, guys! I love your PSL effect theory. That’s definitely the cause of the September happiness spike. This recipe is so great! I’ll have to make it for my PSL-obsessed family! Great PSL recipe!!! I totally agree with your theories about PSL and its weird effects on people, haha. Oh my God…that looks AMAZING! This looks so good! I really want to try this seeing as how I love all things pumpkin! STOP I have to try immediately. Great post!! I was very excited about a pumpkin spice latte recipe last year that turned out to be a major fail. Can’t wait to tr this! OMG I love you guys for this post. Seriously obsessed with everything pumpkin spice! Oh man, I would be in so much trouble if I had an espresso machine at home. This looks so good. yum!! i love this idea. sounds amazing! I work at SBUX, and to ease your mind not all the SBUX syrups have dairy, just the thicker ones. IE the mocha, white mocha, psl, and caramel brûlée. Hope that helps. What a fun idea! So excited to try this recipe, and a pile of other pumpkin recipes that are building. Yay!! This looks freaking awesome! Thanks for sharing. Can’t wait to mix some up. Can’t wait to try this! Thanks guys. It seems so nice for me because there are so many cinnamon in Sri Lanka and Starbucks are so much expensive for Sri Lankan Rupees. I should ask from mom and make it together! I really want to try, can’t wait to move to my new home and try all the things here! Cannot WAIT to try this! Looks so good! Thank you for sharing! I can’t be going to Starbucks everyday! About how much syrup would you use for a large cup of coffee? Milk? Thx. This is brilliant! There are no other words. move over @starbucks this is such a great alternative to have PSL at home!!! love it! Ah yes finally PSL season!!! This starts my favorite time of year: crisp mornings, crunchy leaves, log fires, candles and PSLs!! I’m now getting into all things pumpkiny!! Lovely! Might try freezing in an ice cube tray so I can spread it out over longer than 2 weeks. Ohhhhh! My husband made me something similar to this for me last year! It was amazing! I’m not going to lie though, I totally thought he did something wrong because it separated. I can’t wait for it this year, it has just finally gotten cool enough for me to switch back to hot coffee drinks. p.s. I just love love love your blog! So I had to try this immediately! It is awesome! All the goodness with out the high price. Thanks soooo much for posting this you guys are great! I’m a non-coffee-drinker as well, and my hubby prefers his coffee unadulterated, but I might have to think of another way to use this – as an Australian I’ve never tried pumpkin-spiced anything (except pumpkin pie), but I’d love to give it a go. I love that you posted a recipe for PSL syrup. I just can’t drink the PSLs at Starbucks – they have a weird after-taste that I just can’t get over. However, I love the idea of making PSLs at home – yum! My immediate thought upon reading this post was “I love them!” Pumpkin Spice Lattes only popped up in London last year, and for a much shorter period of time than in the US. I think they taste like cosy autumn, and I’m so excited to try this at home version! Thanks! Yum! I can’t get PSLs where I live in France, but I can definitely make this! I’ll be taking some to work too to share the PSL effect with France! I just made this and OH MY GOD. It’s amazing. So easy, so tasty. THANK YOU! YUM! I need to invest in an espresso machine. The Caribou Coffee near my office that recently closed told me their pumpkin chai was made with pumpkin puree… they must have stolen your idea! TOTALLY TRYING THIS! You’re awesome, Emma. Haha you are so right. There is something about the start of Fall that makes people nicer. It’s the start of a new season and people haven’t started to holiday stress quite yet. I wanted to post this here because I had been curious about the ratios of this recipe as well! 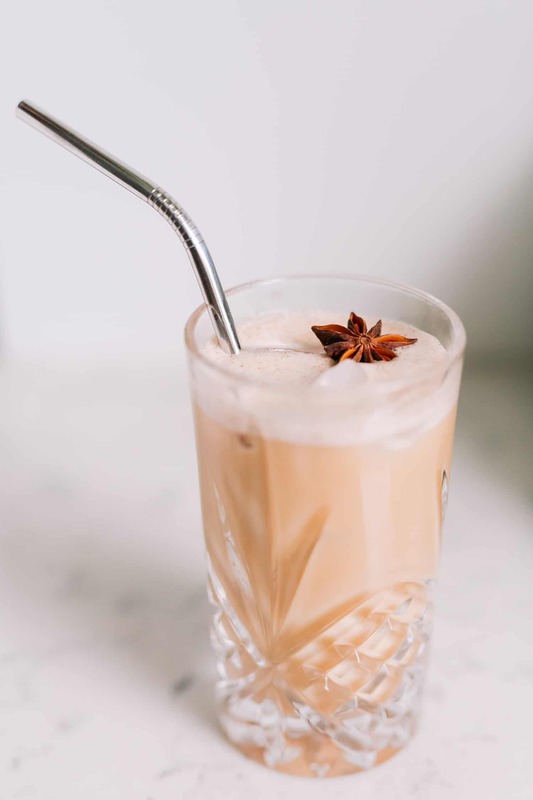 I finally just did some research, and found this; here is a very similar recipe, but the author discloses the amount used to make a latte [about 2 tablespoons of syrup & 5-6 oz of steamed milk] http://www.annies-eats.com/2011/10/03/diy-pumpkin-spice-syrup-for-pumpkin-spice-lattes/ ..
Another recipe I found suggests using PSL syrup with half&half to make your own pumpkin spice creamer for regular coffee [use one part syrup to one part half&half]. Hope this was helpful! This is so good!! I’m living in Japan right now and their pumpkins are a bit sweeter so I cut down the sugar. I love this! It is nice to have a taste of home. I made milkshakes with this last night at our church’s Snack Shack. This syrup mixed with vanilla or butter pecan ice cream makes an AMAZING milkshake!!! Very excited to try this in my coffee. Just finished separating the solids from the syrup. I had a lot of solids left since I went overboard with the pumpkin so I think I’ll refrigerate it and try it on biscuits like pumpkin butter. A quick taste test tells me it is delicious. Holy moly! You girls have just made my year!! We still don’t have PSLs in the UK until mid October so I’m super excited about this!! I recently got back from my honeymoon in San Diego & Palm Springs and just had to get a large PSL at the airport haha! Im wondering how long it will last? I want to make it for my friends for Christmas! I love PSL!Absolutely going to try this. I just made it(I may or may not have added more pumpkin puree..Shh!) and was impatient to try it until tomorrow(it is way too late for coffee) and really wanted something cold, so I made myself a pumpkin spice “creme frappe” YUM!